Seems too good to be true, I know. So does the fact that I'm actually posting. HA. Seriously though, I do want to post more. It's just, I'm on vacation right now. And there is no stand mixer here. And no food processor. And the gluten free flour aisle is pathetic. And I really just want to sit on the beach and think about chocolate chips all day anyways. Seriously, I found my new favorite chocolate chips. I even dug the package out of the trash can so I could remember to tell you what kind they were. I guess they're called Nestle Dark Chocolate Morsels. They're just... so big and beautiful. And they melt really well and are just overall delicious. I know, they probably have some dairy in them, but it won't hurt to have one or two, eh? Okay, so let me tell you about this banana bread. I love it because it's really moist and... sticky? Does that sound weird? Well, I like it. And it's healthy! You can keep it even healthier by skipping the chocolate chips and maybe adding some chopped nuts and dried fruit if you want. Or just add nuts, fruit, and chocolate chips. That works too. Now, if it isn't your goal to make a healthy snack that you won't feel too guilty about when you down half a loaf for breakfast, you could always try my Nutella swirled banana bread. You could even try it with gluten-free flour! It's full of butter and sugar and all the goods, and since it is Fat Tuesday after all, I wouldn't blame you. Seriously though, the one day I post something healthy-ish, it's Fat Tuesday. What is wrong with me. Okay, so wanna hear the big secrets to this bread? Well, first of all there is no butter or oil. Instead there are bananas (um... duh) and unsweetened applesauce. Seriously, I don't know why they usually sweeten it. I can hardly tell the difference. The other secret is adding honey instead of sugar. I mean, supposedly that supposed to be better for you. You could also use maple syrup or something. Orrr.... you could just use the sugar. You'll probably survive. Obviously, the final secret is using gluten free flour. I used white rice, but what I really wanted was oat flour. Like I say, this grocery store down here has no selection and there's not even a food processor to grind my own oats. It's a tough life my friends. Anywho. You should definitely make this. And if you use oat flour, please leave a note in the comments to let me know how it turned out!! Grease two 8 inch loaf pans or a 10 inch loaf pan. Preheat the oven to 350º F. Mix together the eggs, honey, applesauce, and vanilla. Mix together the flour, salt, soda, powder, and cinnamon and add to the wet ingredients. Stir in the mashed bananas and mix well. Add in any mix-ins. Divide even in the pans and bake about 45 minutes for two loaves or an hour for one (until a toothpick comes out clean or with a few crumbs attatched). I cut each 8 inch loaf into about 12 pieces. Don't forget to follow on Facebook and check out the other blog! When you say you used white rice... how exactly? I'm not experienced with gluten free yet, and that is an intriguing idea! You can buy white rice flour in many grocery stores if they have a gluten free section. If they don't have it, you can check in any health food store. Also, most gluten free all-purpose flours are mostly made of rice and would work great in this recipe. I will for sure be baking this. I will be using egg whites, however, in place of the eggs. I will try it with the oat flour and let ya know! Would this make good muffins instead of making it in one pan? Also, would spelt flour work? It should make good muffins. And I think spelt should work fine. Please don't take the name of my Savior in vain. Thank you. Made this. Amazing as always! You never disappoint! 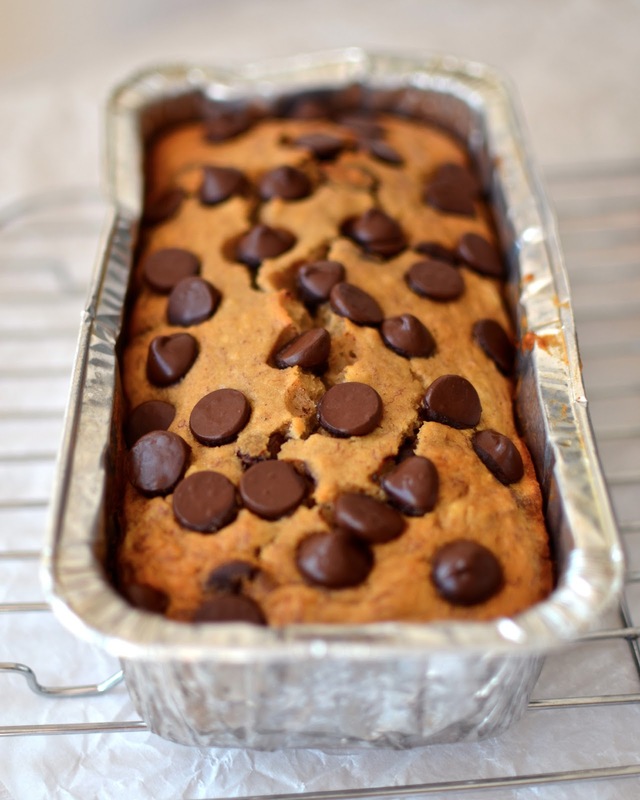 What would you suggest if I wanted to make this pumpkin banana bread? Would you just use less apple sauce and mashed bananas and substitute with pumpkin puree? I made it with oat flour, honey and applesauce. I also used the chocolate chips and I think it is great! I was also wondering about using pumpkin instead of bananas. I tried this today. I used homemade pear butter (just like apple sauce) instead of apple sauce because I ran out of it. I did not use any add ons (nuts or chocolate chips) and also used half agave nectar and half regular honey just to finish it up. It turned out super! I love the texture. It was not dry because of the rice flour. Thanks for sharing. Need suggestions - I made muffins - they rose beautifully, but I had no idea how long to bake, so kept checking them - 10 min, then each 5 min thereafter. They sank horribly when I took them out at 35 min. Does anyone think that opening the oven (and letting the temp drop so many times) could be the culprit? They did seem done after 35 min, so maybe I should just try again, and not open it until 35 min? 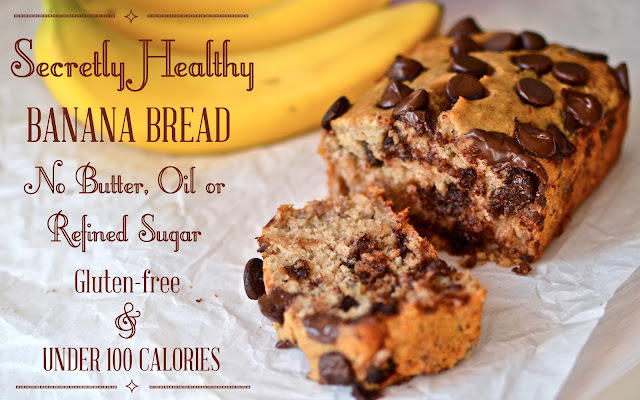 I never eat before these kind of choco chip bread with added flavor of Banana. i think this bread is especially made for those who do daily workouts in Gym. But i take it only for my taste and chocolate is my weakness so i can't live without eating it. I made this today - really good! It was perfectly moist, just the way it should be in my opinion. I would love to try next time using oat flour, but I only had boring whole wheat flour. It worked very well though! I also only used half the amount of honey and added an additional 2 tablespoons of light brown sugar. For someone with a raging sweet tooth, it was a good amount (though more sugar would have been delicious too). Also I only had 2 small brown bananas so I supplemented the rest of the 1.5 cups with pumpkin puree... yum! I can't eat apples or pretty much any fruit except bananas, which is why I really want to make this. 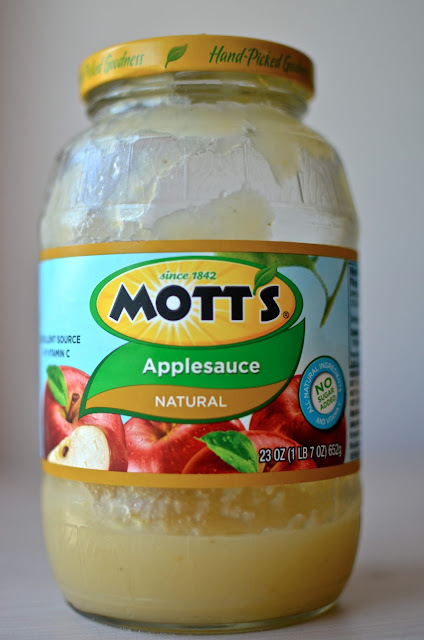 What can I use to substitute for the applesauce? I can eat real butter - would that work? Sure! Oil would also work. I just made this recipe for the first time. I doubled up on everything in order to make 2 large loaves, one of which will be sent to California in a care package for my daughter/college student's care package. I used 3 cups of brown rice flour and 1 cup of coconut flour. Everything else, I did as you said. It's baking now. I'll let you know the outcome! Oh I lied! I used maple syrup instead of honey. The verdict: Absolutely friggin delicious. It's light, fluffy, just sweet enough and not too sweet. I adore this recipe and it will be printed. In my world, when I use precious and expensive ink to print a recipe; that means it's beyond delicious. I will share your site and your recipe. And I only tasted the part of the cake that stuck to the dish while it was still warm :) YUMMMMM. And a big, fat THANK YOU! what if you don't have baking soda? Help…. It looks delicious , I would like to make them,but could you help how many bananas will i need? :) Because in Hungary there isnt "cup". I made this with oat flour and it came out delicious! Very moist. HELLO! I made this with oat meal and blended it in my ninja. IT WAS AMAZING, my whole family loved it so much it didn't even last three days! Thanks for sharing! Mine are in the oven right now! Can't wait! Can you use coconut flour instead of oat flour? I made this last night, with a few alterations inspired by a couple other recipes. I replaced the applesauce with 1/2 cup natural peanut butter and 1/4 cup milk, and I used 3 medium bananas and only mashed them into chunks, not smooth, so there would be chunks of banana in the bread. Oh, and I used oat flour, and no mix-ins. It was really good! Thanks for the recipe. :) I've seriously made your Oatmeal Cookie Pancakes like every day for a week. And sometimes for supper. They're AMAZING! I used coconut sugar and gf all purpose flour. Mini chocolate chips GF --worked out great. Put in mini bread pans...cooked for 35 min. DELISH. Thanks for the inspiration. I just made this and it is fantastic! I usually don't eat bananas, with the exception of banana bread. Thanks so much for the lightened up recipe! This is the best healthy banana bread recipe i've made so far! So moist. This is great! I made it with 3 bananas and a mix of buckwheat and almond flour and it came out perfect! I want to make it again today, but try it without eggs since I can't eat them. What do you think how it will come out? I halved the recipe and made one 8 in loaf and used oat flour. I was worried about the consistency but it was PERFECT. Can't stop eating it, I even had a piece for breakfast! Mine didn't cook all the way through - I subbed flax eggs for real eggs and the whole thing came out pretty mushy. Nonetheless delicious... And it was all eaten anyways... But definitely underdone. I've never had a problem subbing flax eggs in quick breads before so I'm wondering if I had added too much banana (I eyeballed) to hold together properly. Giving it another go today being more careful with measurements. I threw these in the oven just now. I used 1/2 cup more mashed banana and 1/2 cup less applesauce.. also used xylitol as the sweetener. Can't wait to see how they come out :) The batter sure tasted amazing. They came out great! thanks for the recipe. Probably may have come out more fluffy if I followed the exact recipe. I made mine exactly like the recipe says, except I used yoghurt instead of applesauce and no add-ins. I baked it in one tin for 45 minutes and it came out so mushy :( it tastes amazing but the texture is like an undone cake, too moist. What did I do wrong ?? The flavour is amazing though! This is my second time baking this recipe. Thank you for this! It's so healthy and so yummy! I added only 1/4 cup of honey the first time and I thought it was still pretty sweet so I added even less this time. I also added other toppings like walnuts, pumpkin seeds, sesame and dark chocolate chips.